Oil analysis provides information about the extent of this contamination, and related oil degradation status, so that oil changes occur based on condition, not time. But what causes contamination to occur in engine oil? Exhaust gases (blowby gases) that leak past the piston rings, valve guides and turbocharger seals into the crankcase. These gases contain particles of carbon, water, acids, partially burned fuels, varnish, and lacquers. All of these particles contaminate the oil. Sulfur Oxides (Sox) are common gases with sulfurous fuels (diesel, liquid fuel distillates, heavy fuel oil); Nitrous Oxides (NOx) are more pronounced with Natural gas (CNG, LNG, Propane) fueled engines. Hydrocarbon Oxidation (HCOx) will be present in varying amounts. As the lubricating oil comes in contact with hot engine components, or when heated oil comes in contact with entrapped air, oxidation and decomposition occur, creating contaminants such as acids, varnish, and sludge. These contaminants are generally associated with engine malfunction. Fuel dilution, however, can also be caused by excessive engine idling or stop-and-go operation. Fuel dilution of the oil causes a loss in viscosity, resulting in severe wear and possible seizure if left unchecked. Faulty injectors, clogged air filters, and fuel pump failure are the most common sources for fuel dilution, though in some cases fuel lines can rupture and contaminate the oil. Water vapor enters the oil as a byproduct of combustion. Backup generators, and low load engines do not allow the oil to get hot enough to boil off the water quickly. Water combined with blowby gases creates acids, which degrade the oil and corrode the engine surfaces. Ingressed water sourced from the environment, or broken cooling lines will cause the oil to degrade rapidly, and in worst cases lead to severe wear and engine failure. Glycol based engine coolants are widely used. Cooling system corrosion, head gasket seal rupture, or cooling line fittings integrity loss all can lead to coolant mixing with the oil. Glycol is especially corrosive to non ferrous bearing surfaces. Excessive coolant leads to the telltale sheen or mayonnaise oil emulsion, leading to engine seizure. This contaminant is caused by retarded injection timing and burning fuel mixing with oil on the cylinder liner(s). Excessive soot causes abnormal valve and injector train wear, can overload the emissions control systems leading to air quality fines. So what tests should be included for Engine oil monitoring ? Any testing for engines needs to incorporate tests to check for those common contaminants, along with tests to determine oil viscosity, and wear metals. Infrared Spectroscopy is a great technique for detecting organic contaminants, water, and oil degradation products in a used oil sample. One measurement gives a wealth of information about the oil condition and contamination. If oxidation becomes severe, the lubricant will corrode the critical surfaces. The greater the "oxidation number", the more oxidation is present. Conditions such as varnishing, sludge deposits, sticky rings, lacquering and filter plugging occur in systems with oxidation problems. Nitration is another important parameter that looks at the extent of NOx compunds present in the oil. These compounds can react with water in the oil creating nitrous acids that degrade the oil and reduce the effectiveness of additives. This can create varnish, laquer and engine deposits. Antiwear Additive: measured by IR, it is a measure of remaining ZDDP additive present in the oil. ZDDP is the major friction reducing additive; if it is exhausted, less protection is present against abnormal wear. Soot: A measure of the carbon present as measured by IR, in wt %. 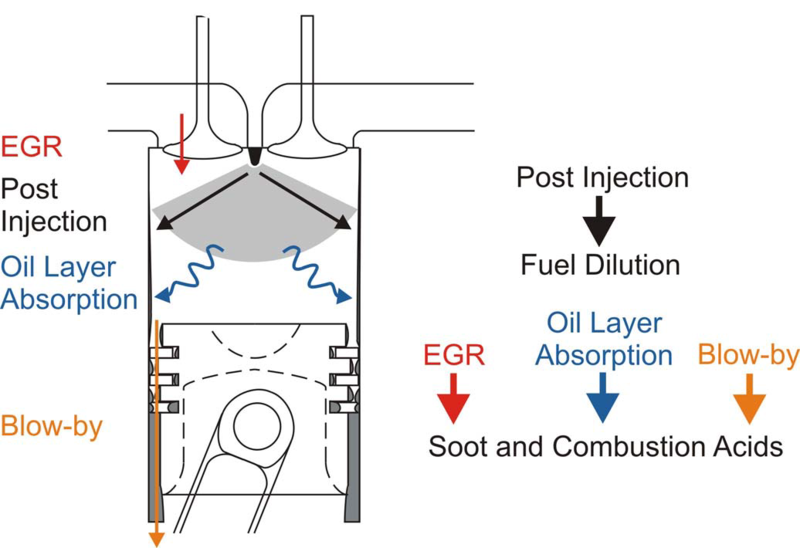 Though most engine oils have additives present to disperse soot, increasing amounts can overload its ability to do so, leading to wear and poor operation. Glycol Content: A measure of the liquid glycol present , in wt %. Glycol coolants break down in the high temperature engine environment, leading to formation of glycolic acids. These acids attack nonferrous bearing surfaces and form metal salts. The acids also react with the oil anti wear and anti oxidant additives and, along with water, create sludges that plug filters and cause the oil to lose its lubricity properties, thus increasing abrasive wear. Glycol contamination in engines and transmissions is considered to be a more severe contaminant than water alone (up to 10 times more damaging). Depending on the oil temperature, the glycol coolant may break down rapidly or over time. This instability is a major challenge for determining the true glycol content in the oil at a given time, and is the major reason why field and lab tests often do not agree with each other. Viscosity is the resistance of a fluid to flow. Kinematic Viscosity is the most important lubricant physical property for engines. Engine oils usually are multigrade formulations, designed to allow for normal engine operating g over a wide range of startup operating temperatures. Viscosity is usually reported at 100° C. If viscosity of the lubricant exceeds ranges set forth by SAE for minimums and maximums, it needs to be changed. Oil viscosity is expected to rise over time and use as soot and solids increase. A loss of viscosity in a engine is considered to be more serious than an increase, and a usual culprit is fuel contamination. Total Base Number (TBN) is a measure of the alkaline reserve in a lubricant. This has often been measured by titration, as in the Karl Fischer method, but can be measured in other ways as well, such as by Infrared Spectroscopy. Blowby gases, combined with moisture from aggressive acids in the crankcase, deplete the base number. Engine oils contain additives designed to react with the acids formed and neutralize them. The base number is used as a guide to follow the additive depletion of an oil in service. Oil changes are often indicated when the TBN value reaches a predetermined level for a given lubricant and application. An abrupt drop in TBN would be indicative of abnormal operating conditions (e.g. excessive blowby) that requires investigation. Most lubricant suppliers give TBN condemnation limits in the bulletins. Usually when the TBN value is 30% of the original starting value, it is time to change the oil. For engines running high sulfur fuels, an oil with a high starting TBN value high is recommended, and the alarm limit is 50% of the starting value, not 30%. Water is one of the most common contaminants. Water can enter the engine oil as a byproduct of combustion, or as a result of a cooling system leak. Though the engine oil temperature will be high enough to drive out moisture when operating, high amounts will induce damage wear. Excessive water entering the engine due to leaks or ingression will cause severe wear leading to engine seizing.. Water contamination should not exceed 0.25 % for most engines. Total Acid Number (TAN) is a measurement designed to indicate the relative acidity in a lubricant. This measurement is often done by titration. The acid number is used as a guide to follow the oxidative degeneration of an oil in service. In engine applications, TAN is recommended for natural gas fired engines. An abrupt rise in TAN would be indicative of abnormal operating conditions (e.g. overheating ) that require investigation. Most lubricant suppliers give TAN condemnation limits in the bulletins. Usually a rise of 2.0 over the starting value is cause for concern. Ferrous Density is a measure of the total amount of ferrous magnetic debris present, measured in ppm. Measured with a magnetometer, ferrous debris ranging in size from sub micron to visible sizes will induce a change in electrical current proportional to the amount of magnetic metal present. The amount of ferrous debris in total is a key indicator of wear in any engine and should be included on all screening test packages. The actual value in ppm is trended. An increase of 10% in the wear rate indicates an abnormal change that might require intervention. Fuel dilution is a measure of the unburned liquid fuel in the lubricant as a result of leaking injectors, poor seals, or poor combustion settings. All engines tolerate some fuel, less than 2% is expected. More than 5% is an issue. It is measured by either GC or SAW sensor (fuel sniffer) and usually reported in wt%. 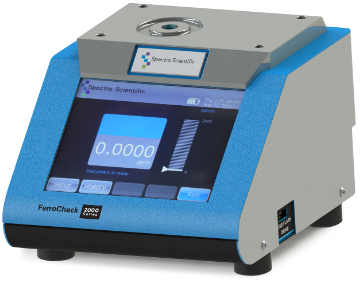 Particle count is a method used to count and classify particulates in a fluid according to accepted size ranges, usually according to ISO 4406 and SAE 4059. A very helpful test to improve reliability, reducing particulates in the oil will extend the life of the engine. It is usually an optional test for fielded engines as the soot content usually precludes an accurate particle count. Particle count is commonly used in engine development, as technologies such as LaserNet have the ability to measure particle count effectively in oils containing up to 1.5% soot. Ferrous particle count is a technique that quantifies the ferrous debris present according to size and quantity, not concentration. Built in magnetometers (online or LNF) are common today, as well as the DR (direct read) ferrography system. Useful for expanding on how much and how large the ferrous debris particles present are, which augments the spectroscopy and ferrous density techniques. All measures the ratio of large and small particles in the sample, and the data may be used to calculate the wear particle concentration and the severity indexes, which may be alarmed. Elemental Spectroscopy is a technique for detecting and quantifying metallic elements in a used oil resulting from wear, contamination and additives. The oil sample is energized to make each element emit a quantifiable amount of energy, which indicates the element's concentration in the oil. The results reflect the concentration of all dissolved metals, either from additive packages or in the form of particulates. 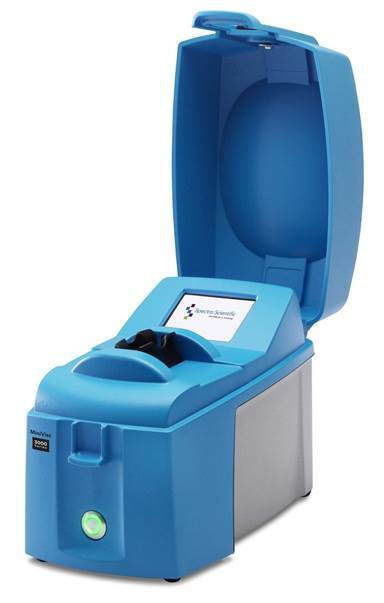 This test is the backbone for all on-site and off-site oil analysis tools, as it provides information on machine, contamination and wear condition relatively quickly and accurately. Its major limitation is that its particle detection efficiency is poor for particles 5 microns in size or larger- which is why the Ferrous density must be measured first. WDA describes either a patch or an analytical technique which separates magnetic wear particles from the oil and deposits them on a glass slide known as a ferrogram. Microscopic examination of the slide or patch permits characterization of the wear mode and probable sources of wear in the machine. This technique is known as analytical ferrography. It is an excellent indicator of abnormal ferrous and non ferrous wear, however it is usually only carried out by a trained analyst. For a summary of recommended test parameters, see table below.